You should pop over to the new illustrated blog, Cattywumpus because it's by the gifted artist, Ann Boyajian. 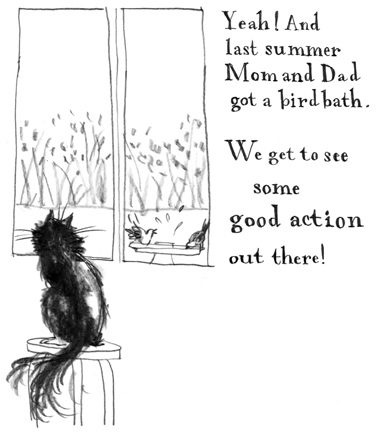 The blog follows the adventures of her two adorable cats, Lucifee and Skootch. You might remember Ann from a previous post I wrote entitled, "Artist Inspired by Cat Muses" about Lucifee and Skootch's work as artist models. Ann is the illustrator for my book, Careers for Your Cat and she totally gets cats! Ann and her kitties would love some feline friends. To follow their story, start at the first blog post. Two paws up to Cattywumpus! How fun they are, I will go visit! Have a happy, happy weekend! on my way!!! Lover her artwork! Love YOU! We like those drawings. Lovely. Thank you for your sweet comment today Ann, I appreciate it. Checked out "Cattywumpus", it's great! What an adorable picture, our cats dont have a bird beeder but they do have squirrels that climb the trellis on the side of the house! Two paws up for Lucifee and Skootch's new blog! Love it! Going to visit right now. Thanks for the share! I do remember Ann from the post before. I love her drawing! I will go check her blog! !